With all those episodes of “Extreme Couponer’s” nowadays, it gets one thinking “hey, I can do that too!” Or, “One of these days, I will be able to do that!” “Maybe I’ll get around to using a coupon next shopping trip.” “Wait, how DO I use coupons exactly?” Or perhaps more aptly, “What the heck are they going to DO with ALL THAT STUFF? !” I have to admit, I’ve thought all of the above at one point or another. Right now at Target, there’s a special where for every L’Oreal advanced hairstyle product you purchase, you would receive a FREE trial sized L’Oreal shampoo or conditioner. I could’t find them for the life of me, so I finally asked a manager and he said that their shipment of those “freebies” hadn’t arrived yet, so in lieu of that, they were taking $1 off of each product (where one of these freebies was advertised) at the registers (since those trial sized items are usually about $1 anyways). 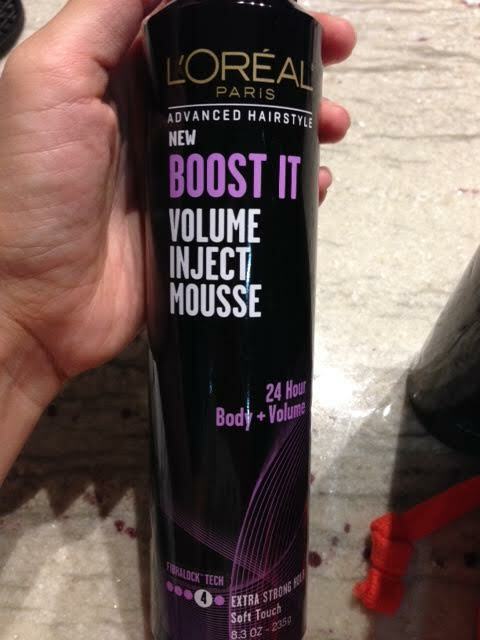 SO, this immediately brought the mousse down to $3.49 each and the hairsprays down to $2.94 each. Already pretty good deals! From this point, without using any coupons, my total out of pocket should have been $26.91. But of course, this is a post about couponing right? So bring on the coupons! 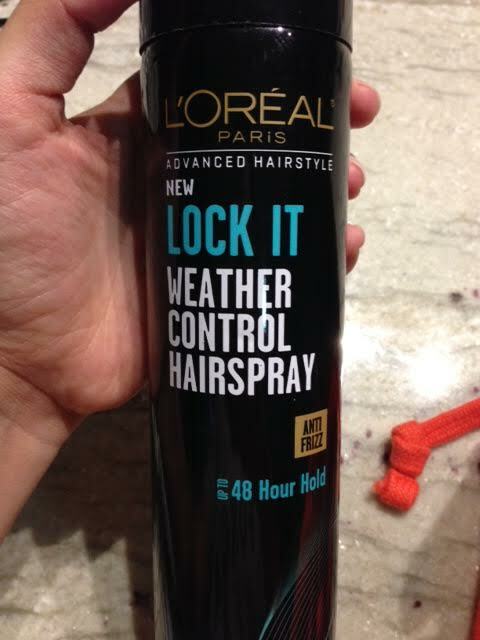 If you go to Coupons.com, you’ll be able to find a L’Oreal coupon for $5 off 2 L’Oreal Advanced Hairstyle products. I printed 3 of these – 2 off of my computer and 1 off of my phone (you can print 2 of the same coupons per device, so I frequently print things from my computer, iPhone, and iPad if I find great coupons!). 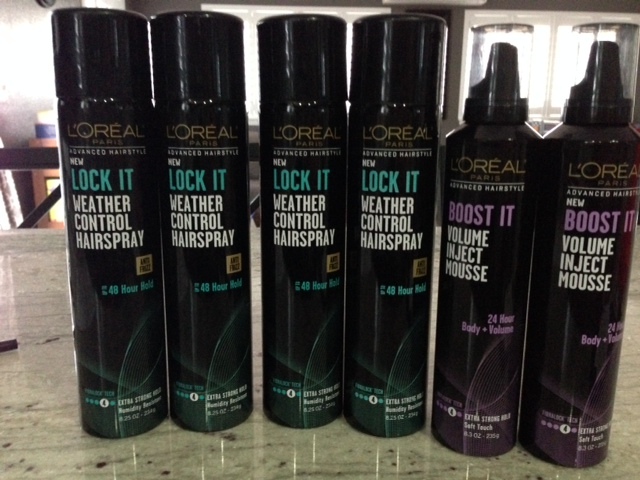 Since I was buying 6 L’Oreal products, I was able to use 3 of these $5 off coupons for a total of $15 off. I always make sure to read the fine print on my coupons to make sure that you’re allowed to use multiple coupons in 1 transaction. (Usually, it’ll state “no more than 4 of like coupons to be used in same transaction”.) The last discount I used was a $5 off $15 personal care purchase via a Target Mobile coupon. In the personal care aisles at Target, there are signs posted all over the place about how to get these mobile coupons (text “care” to 827438), then show the cashier the text barcode to scan. SO easy. 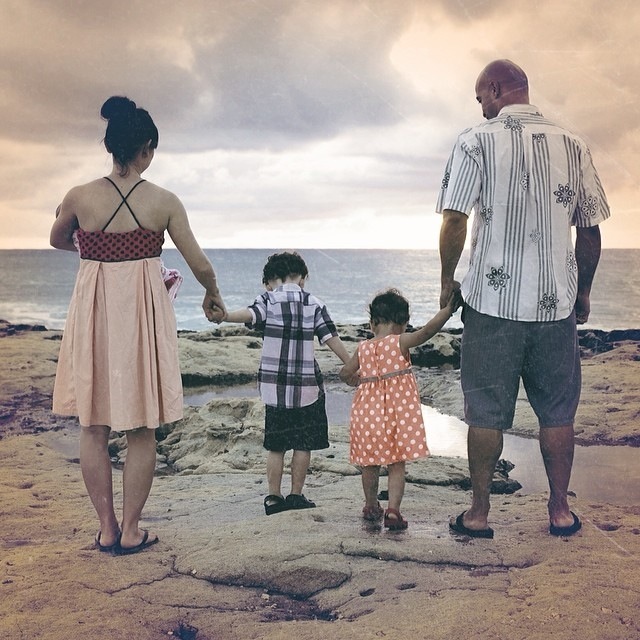 Once you sign up for those Target Mobile coupons – you’ll periodically receive texts with new offers. ALWAYS worth a browse….I’ve been able to get discounts on fresh fruits, veggies, paper products, detergents, etc…all on things I was going to buy anyways! -$5.92 +TAX (however the math for that factors in) = $6.91 TOTAL out of pocket. 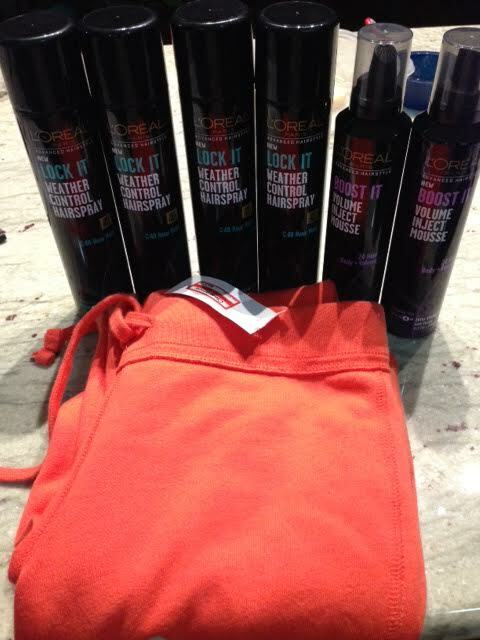 Since the pants alone were $7.18 which is MORE than my end total, this means that I actually made money (to use towards those pants) from purchasing these 6 hair products. I’ll take “making” money while shopping anyday! Even if your Target has those trial items in stock (the free gift with purchase) and therefore isn’t taking off the extra $1 per item, you’ll still end up with free trial sized items, and spending about a buck (give or take) on each item. That’s still a DEAL in my book! Well, not THAT kinda cartwheel, although it does make me wonder if I can still do a cartwheel these days… But I’m talking about the Target Cartwheel app! 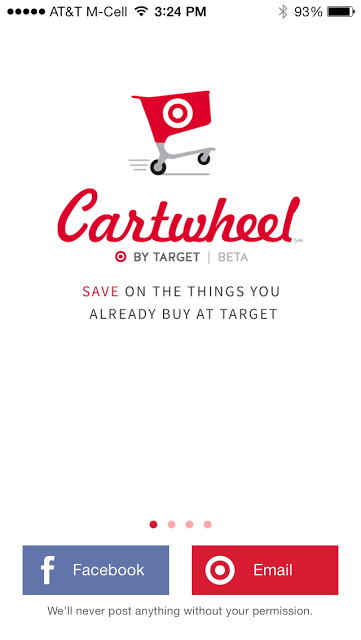 I’ve briefly heard about the Cartwheel app before, from a website that highlights coupon deals, but I never really looked into it much. Well, this morning, I saw a Facebook post from that same savings website, and it mentioned that all Target Up&Up brand products were 10% off when using the Carwheel app. SO, I decided, this was just the interesting push I needed to download it. 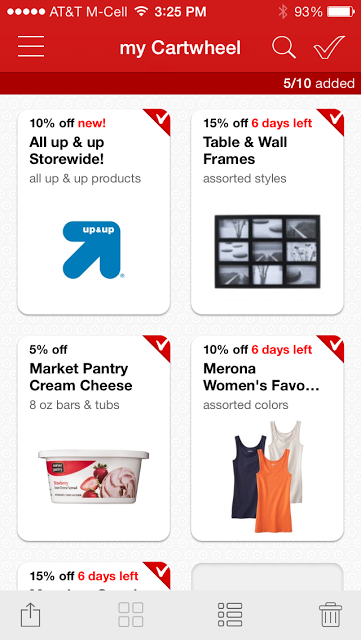 This app is so easy to use that after running some errands with my family today – and having 2 out of the 3 kids fall asleep in the car (Marv stayed with them in the car) – I was able to make an impromptu trip to Target and add some deals directly while in the store (using Target’s nifty wifi too…). 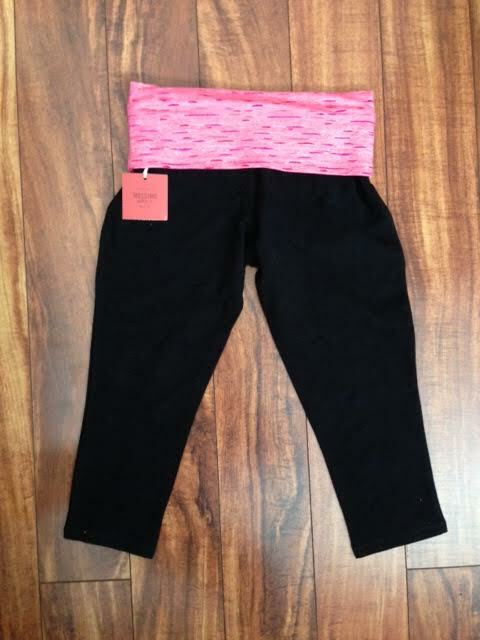 I originally ran in for a pair of workout capri’s (I already own an all black pair that I LOVE) since they were on sale from $17.99 to $12 this week. Of course it’s nearly impossible to leave Target with just ONE thing…..I ended up picking up a few other odds and ends along the way too. 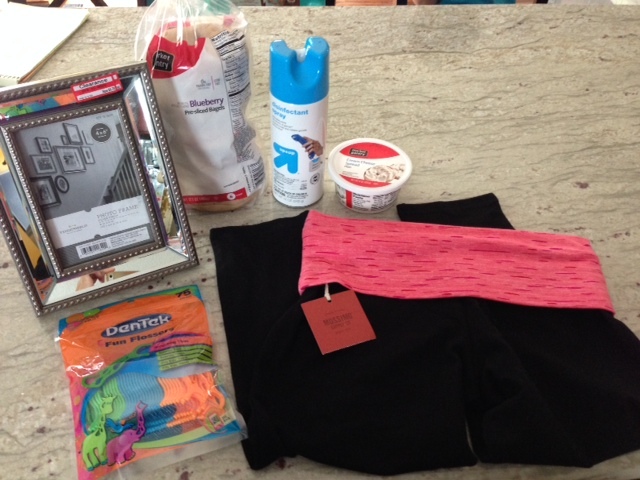 Before checking out (since the lines were SOOOO long…on a Sunday, I should’ve known…) I quickly scanned the deals on the Cartwheel app and was pleasantly surprised to find a deal for almost everything in my cart! 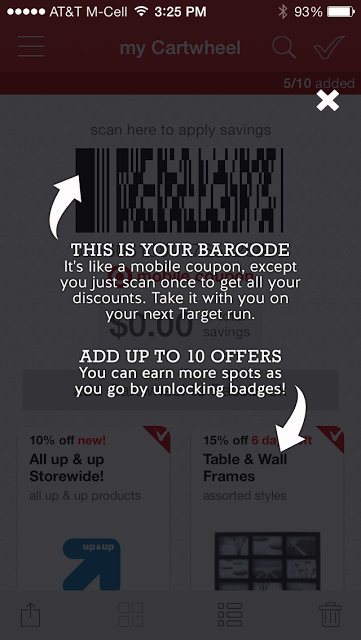 Anyways, at the register after scanning all your items, all you have to do to use your Cartwheel app (after adding all your discounts onto your app beforehand of course) is to show the cashier the barcode on your phone – they scan it, and voila, discounts applied! 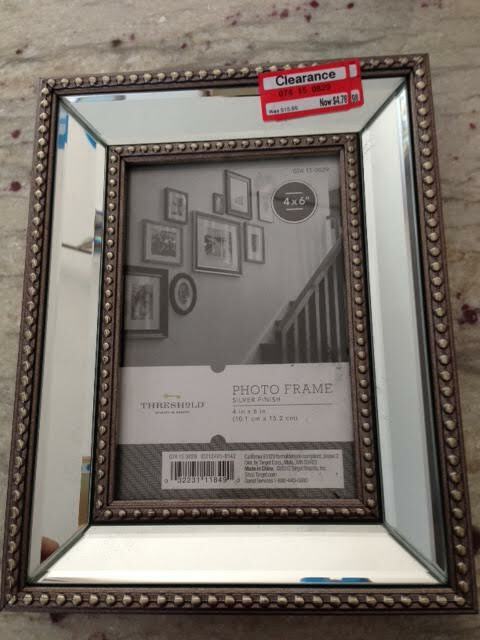 Today, I saved $2.94. May not seem like a ton, but I was ecstatic! 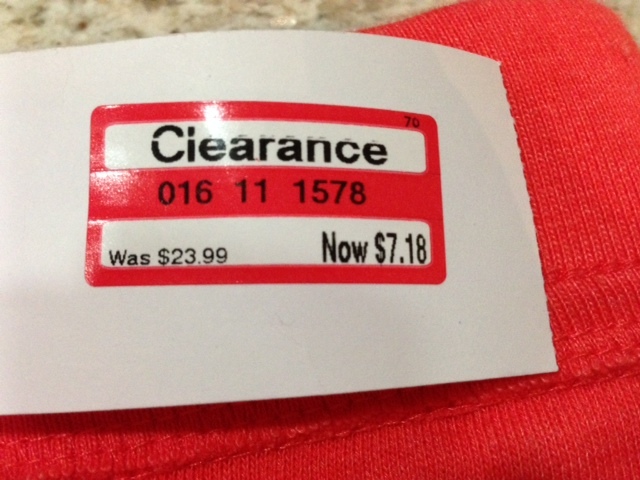 I LOVE saving money and getting deals. Yep, you could say I “won” today at Target 😉 SO, moral of this post = Cartwheel app is amazing, free and so easy to use…if you didn’t know, now you know!